Yes, the Grandma of our class does still exist -- I, Sally Smith Stephens, did respond in recent years but the e-mails failed to go thru -- so I am also sending this one to Nancy Thier as advised. Rick and I are still in Columbia, S.C. and now both retired. Rick stopped professing after 35 years at University of South Carolina. We are looking forward to lots of traveling -- had a great time on a cruise to Alaska and fun week in Seattle this year. There are lots of Smith relatives in the Nashville area so we have visited them and the Vandy campus. We'll be heading to Disney World the week before Christmas with our daughter's family. Next year we plan a trip to Ireland and then on to our 50th high school reunions in KY and TN. On the home front I continue to spend lots of hours each week volunteering at a local cooperative ministry, local library branch and our church. And, of course, spend as much time as we can with our children and four grands! Brent, his wife Sheryl, 10-year old Caroline and 7-year old Ty are in Fairfax VA where Brent is a structural (forensics) engineer. 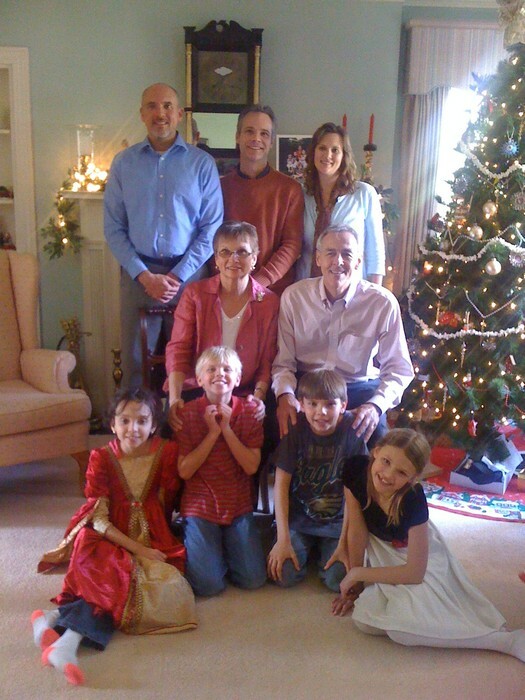 Sally, her husband, Mark, 10 year old Madison and 7 year old Mia are nearby in Lexington SC. Your computers would crash if these proud grandparents exercised all our bragging rights!!! If traveling near Columbia, please drop in for a visit! Hope this is reaching you in time for circulation. 2013 has been quite the year!!! My 2 times per week volunteering (at county library and very busy food pantry) has kept me over busy and living in a too rushed way. So I cut back to once per week in early January 2014. In June, I slipped on a rug and tore my left plantar fascia. In the five weeks before I could walk normally, I moved daily workouts to a great local gym and fell in love with vigorous machine workouts!! So now I'm a gym rat!! In the fall I developed a new to me allergy to ragweed or mold. This set off an asthma flare which took prednisone and antibiotic to clear. So in Feb 2014 I do allergy testing and no doubt. Isn't aging FUN??!! I'm glad the 45th reunion was so great. I plan to make our 50th. I wish you all a terrific 2014! This past year just flew by. As I get older they seem to go faster. I am still working 30 or more hours a week at Childrens Hospital. Our satellite office closed January 3 as we moved to a new hospital Childrens built in the southwest part of Denver near our home in Highlands Ranch. It is a smaller version of the big hospital and gorgeous. One whole side is glass and faces the mountains. It was a huge undertaking to move and by yesterday I was exhausted. I hated to miss the reunion but we had planned a trip to Ireland that weekend. We had a wonderful time. We went through CIE Tours and they did all the reservations for the plane, hotels and car. We picked up our car in Dublin after a day there and drove the predetermined route and got to stop whenever we wanted to for a point of interest. Ireland is indeed green and gorgeous. So many beautiful castles. Some of them have been restored so we could get the feel of what it might have been like to live in one. Food was not so hot but good enough. Since marrying Tom, I have enjoyed all the younger grandchildren he has. I am now Nana Karolyn to them. My grandchildren are almost 15 and 18, smart and involved in sports. Denver is a great place and I am very happy here and being with sweet Tom! Merry Christmas and Happy New Year to everyone. The highlight of my year has been reunion, and the terrific phone calls I have had the privilege of having with many of you who were not able to attend reunion. Separate from this Newsletter, I will send everyone the spread sheet I have with your responses to when this summer we could get together at our cottage in Michigan. This year has been my renewal year. I have started playing tennis again, after about a 25 year hiatus, there is lots of work for me to renew my game on the court. I have also relearned the game of Bridge, and added some of the new conventions which create another dimension to the game. My last renewed activity is becoming much more active with my Church. My son, John, is developing his business, and enjoying the challenge that entails. He does not get back to Charlottesville, VA nearly enough, I must be understanding!! The Alumni Award for Excellence in Nursing is presented annually to a graduate of the Vanderbilt University School of Nursing who is a national or international leader in nursing issues. Doreen Wise ‘68, is the founder, chairman, and former Chief Executive Officer of Medical Research Consultants (MRC). MRC is a certified woman-owned business, and is a preferred vendor for several major manufacturers and pharmaceutical companies, including DuPont and Pfizer. Prior to founding MRC, Wise spent six years as an assistant professor at the University of Texas School of Nursing. Wise worked as a psychotherapist in a private practice for 12 years and as a nurse on the pediatric floor of a Southern California hospital while attending California State University. Wise founded Gabriel’s Gifts which is a foundation that provides support and assistance to families who have a missing person. In memory of a nursing classmate, Wise helped to establish the Janice Ambrey Stalcup Memorial Scholarship at VUSN and in 2004 she was a co-founder of the Pass It On Scholarship. My new (temporary) address is 12301 E. Calle Miel, Tucson, AZ. 85747. Happy 2014! The year 2013 was a year of endings and we are now in a year of New Beginnings. While I was writing the letter to you at the end of 2013, my computer crashed, so I am having to start all over! A metaphor for my life, for sure!!! In January of 2013, our oldest son, Tony, called us in desperation from Wisconsin. We immediately jumped in our car and drove for 7 hours and met him in a hotel where he told us he was addicted to cocaine. It didn’t take us much time to contact some friends and have him admitted to Cottonwood in Tucson. He was really ready for help, so the program worked really well and he is one year clean this month, which we are celebrating. We went to Family Week and that was one of the most meaningful, deepening healing experiences of my life. We stayed with our son, David and his family who live in Tucson—so it was truly a family week! After treatment, Tony decided to move to Tucson with his girlfriend, found a job that pays him very well, attended NA meetings, got a sponsor and also reunited with his children who he had been estranged from for about four years. Health wise, Rich has struggled with stenosis in his back, which has limited his mobility and put a lot of the responsibility of household jobs on me. In August, I called both my sons in Tucson and told them about the increasing difficulty with keeping a house up—and Tony called his Dad and insisted that we move to Tucson. Well—it took about 2 hours for us to decide to sell our house in Michigan and move to Tucson. Both of our sons came out to Michigan to help us get rid of 20 years of ‘stuff.’ We gave away or sold all our furniture. I donated about 1000 books to the library, fully stocked Goodwill with clothes and household goods, and we quickly sold our house and flew out to Tucson on December 18th. We are temporarily living with David and his family until we find a place to rent. I plan to continue doing workshops for the organization I created 27 years ago—Woman Within, International. Also, considering writing another book—yet need to get settled in a new home before I tackle that one! I really regret that I missed the reunion this year. It sounded wonderful and I am hoping someone will send pictures! With best wishes for a great year—2014—even with all of us getting older, may we find ways to thrive in this chapter of our lives. "That email address is good Nov-mid-April and the Florida phone number--which is year-round cellphone--is 407-312-0348. Between mid-April and Nov., the mailing address is 296 May Apple Lane, Mars Hill, NC 28754 and reception in our mountains is better at 828-689-4689." I will add this info to the lists I have and resend to you, but tomorrow, time for bed and an email to John...later, calmness, all is OK.
Happily not much has changed in my corner of the world – except that I can see so much better with the implant of wonderful lenses into both eyes after cataract removal. I finally traveled to Alaska to see my sister, Barbara (BSN ’71) – she has lived there for over 30 years and I now know what her life is really like. I was there during the longest days, and the weather was wonderful. We had a truly great time. Daughter Erin’s Little House Green Grocery here in Richmond VA is doing well, having celebrated its 1st anniversary in December. Unfortunately I don’t see much of Erin as she stays so busy with her enterprise. Grandson Wylie is still completely asymptomatic with his cystic fibrosis and is a real joy to me (when I get to visit them in Austin TX) (I LOVE Skype/FaceTime!). Son Alex sold his business and is now working with a company that deals in sustainable, environmentally friendly building materials. My passion remains the fine embroidery and stitching, but with no one special to sew for most of what I do is given as gifts or to charities. I did get another dog (Lullah died at age 14+++ last January) – a 55# mutt puppy from Animal Control -- Zoe is challenging but lots of fun. And here we are again. After Christmas in NC last year, I went back to Jacksonville with Anne and boys and packed the house for the move Feb 1..during the first snowstorm of the year. Now, a year later, Anne has purchased a house and moved in during a snowstorm. Things then happened like a furnace quitting during the big freeze, living in a hotel, garbage backs up into the dishwasher, sleeping on a air mattress because the wrong mattress came, but feeling quite thankful for heat, a kitchen, and patio furniture in the living room. I’m now back in Toledo and resting up. Anne’s position with Univ Cincinnati study abroad is a great fit. The boys love being near “Uncle Alex.” who goes to the zoo or aquarium or train museum or park with them nearly every week. I’m in the process of changing from oil pastels to acrylic paint. I try that for a couple years and see if I can get the hang of using brushes. Les and I are fine but a tad arthritic! We get to many of the Univ of Toledo Women’s basketball games. Love they are scheduled earlier in the day. Reunion was wonderful. The laughter brought back such memories. Hope to see you all in Michigan this summer. Hello, everyone and Happy Thanksgiving!! I don't believe I've ever sent my news early enough to say that. Hasn't it been fun staying in touch with each other, especially since beginning our reunion planning. What a special weekend and so-o great to have eleven of us in attendance!! I loved every chance we had to visit and especially time with Karen and Sally as we were hotel neighbors. Reunion was my big trip this year, no cruises. Most special were the trips to Virginia Beach every 2 to 3 months. Stephanie and Steve are wonderful parents and my granddaughter, Parker, at 3 1/2 is, of course, still amazing. At home, I enjoy dinners, theater, concerts, movies with my friends from Girls Nite Out, Church Women's clubs, and dear neighbors. Girl friends are the Best!! I attend Aqua classes at Shapes several times a week , really beneficial to the dumb arthritis, Love that hot tub!! I fill in at work whenever I can help with vacation days. It's always fun to work with my old office family and they make me feel really appreciated. The only new news is my upcoming right hip replacement surgery scheduled for Jan.10, 2014. I'm sure all will go as easily as predicted. I'll work hard at rehab, because---- Nancy's generous offer to host us this summer in Holland is the greatest incentive to lessen recovery time. Thanks, Nancy, for trying to arrange this fun get-together for all of us. I'm grateful for all our classmates, all friends, due especially to the newsletter which has kept us in touch all these 45 years. Thanks, again, to Liz, and to all our friends who have worked on our wonderful newsletter. 2014 - where did all the years go? For me and my family our health is about the same. Children and grandchildren the same. Same husband - Chuck did retire in the summer after 38 years in urology. My fears of his driving me nuts have yet to prove true though there is always next week and beyond. I am trying to slow down more and catch up with old friends but that is difficult with everyone so busy in their own lives. Am serving on my church vestry for what I swear is my last time. Still working with the acolytes and loving it. This year I have 30 from 4th - 12th grades. People look at me oddly when I talk about "my kids." Reunion was so much fun and to think I had been leery of our all getting together again. Would we have anything to talk about? Would we have anything left in common? Really!?! It was so good to see your smiling faces that brought back so many memories. And the laughter! Boy, was I wrong! We've gotta do it up right for the 50th. The influenza that has been sweeping the nation has seemed to make a home for itself here. I've had different versions now twice. The latest I am still recovering from, luckier than several people who have died in our little town. Chuck had taken some of our family on a hiking trip in Argentina and was away for most of my worst, but a dear friend took care of me so I have survived. Apparently being of an age has advantages and being a nurse definitely does. Glen Ellen and Dave have been at their cabin. Aside from an occasional flair of Rheumatoid Arthritis, Glenn Ellen is fine. She said her RA is in her wrists, but it is episodic, and five days of medication wipes it out. She sounded terrific, and said to schedule the Michigan get together, that she would do her best to come whenever it was scheduled!!!!! She gave me her email (daveandglenn@gmail.com), however, it sounds as though she does not check it very often. She has a cell phone, but does not carry it around with her, and does not use it very much. So it seems the best way to contact her is by snail mail (2669 Forest Meadow Ln. Billings, MT 59102-7944), or their land line ((406)656-8561), which she will get when she is home. The highlight for me in 2013 was our reunion. Knowing a number of you, Gene marvels how we can talk. He was wise to stay in Miami. We had the highest percent of attendance of any of the schools at the reunion, and we were noticed because of it. I'm looking forward to gathering at Nancy's in 2014 and encourage anyone who is "on the fence" to take the risk. Our family is fine. My 97 year-old-mother has been living with us since August 2012, and we are happy this works. A good day for Mother is when I leave town and my friend Renee plays cards with her. I've been traveling some, but not as much as in the past. The biggest trip was to give the keynote for the European Directors of Nursing Association (ENDA) in Zurich. In September I became President-Elect of the Florida Nurses Association, which is a two year commitment, followed by being President for two years. I simply hope I live that long. I have already made two trips to Tallahassee to speak with legislators about scope of practice issues in Florida, which I thoroughly enjoy. I have also become a Lead Like Jesus facilitator with the company that Ken Blanchard and my brother-in-law, Phil Hodges, founded. And took the training to be provisionally certified as a Design Thinker with a company out of Canada which is associated with IDEO (a company of some fame), with continued hopes of transforming health care one step at a time. Still a member of the breast cancer survivors dragon boat team and keeping up with jogging, but not as fast. Gene is working full-time. Our kids are well. Chris's divorce was finalized in April, so he has taken up running marathons. (I think he just enjoys pain.) We see a lot of his 8 year old, Teresa. We visited MaryLynn, Doug, and their kids over Christmas in KY, and I'll attach a picture. We're in touch with our former foster daughter who lives in San Antonio and keep up with the people who have lived with us over the years. I'm getting old enough now to look back and think how blessed we have been. Happy New Year to all! !